A veteran is using his personal experiences to battle both physician-assisted suicide and terminal brain cancer to protect other patients. “In 2014, when I was diagnosed with a terminal form of brain cancer, the doctors gave me four months to live. They basically told me to go home and enjoy the time I had left,” J.J. Hanson said in a Facebook Live interview with The Daily Signal. Hanson, a former Marine, said physician-assisted suicide exploits patients’ natural depressive states, something he is familiar with. Hanson defied his initial prognosis and is now president of the Patients’ Rights Action Fund, which works to prevent expansion of assisted suicide. Hanson said physician-assisted suicide entices insurance companies to deny coverage for treatment of terminal illness and instead offer coverage for assisted suicide. “People who are making end-of-life decisions have basically been told ‘We’re not going to give you what you’d like to get, but we will give you assisted suicide,’ which is very scary for someone like myself,” he said. In one case, Stephanie Packer of Orange, California, was diagnosed with an autoimmune disease, scleroderma, as documented in a film produced by the Center for Bioethics and Culture Network. This disease targeted Packer’s lungs and caused pulmonary fibrosis, or lung tissue scarring that leads to breathing difficulty. Her prognosis was terminal. 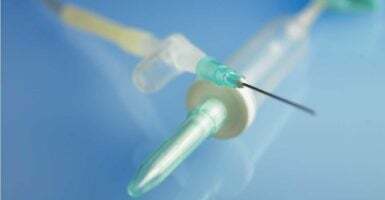 Packer said she requested coverage for less-toxic chemotherapy recommended by doctors, but was denied a week after assisted suicide was legalized in her home state. She said her insurance company confirmed it would cover the cost of assisted suicide. “It was just like someone hit me in the gut. In front of me, I had all the validation that my fears were correct,” Packer says in the film. Hanson emphasized that a suicide option dangerously influences the natural depressive cycles of someone who is terminally ill. During his cancer treatment, he said, he entertained suicidal thoughts for two days. “If I had made that decision in that two days, you can’t undo that,” he said. Major depression may impact as many as 77 percent of terminally ill patients, according to the National Institutes of Health. Depression commonly induces suicidal thoughts and tendencies, the Mayo Clinic notes. Hanson’s wife, Kristen, said short discussions can have significant effects on those who are hesitant to take a stand on physician-assisted suicide. “It’s really not about offering more choices. It takes choices away from patients like J.J. who want to fight,” she said. Hanson said his cancer returned and he continues to undergo immunotherapy, but believes he has made significant improvement three years after his diagnosis. Only 10 percent of glioblastoma patients live beyond this time frame.